Today, in 1881, PT Barnum and James Bailey combined their shows, creating a mega-production, the Circus. After their deaths their circus was absorbed by the Ringling Brothers (1906), resulting in the circus of today. Circus seems to represent a crazed gaiety, a colorful amalgam of the exotic, the dangerous, and the beautiful. 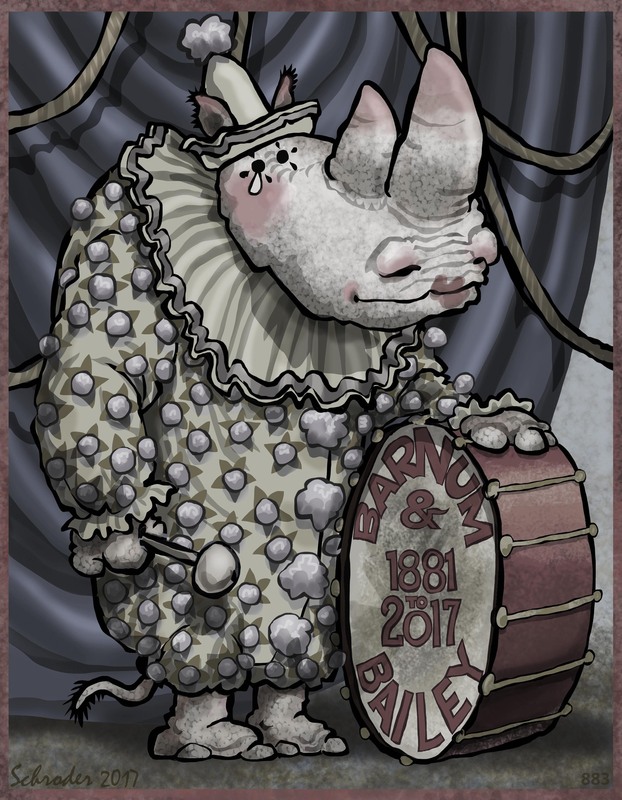 This circus will have its final performances in May of this year; its time has apparently passed. It was an institution, and had a great deal to recommend it, for “Children of All Ages”. Beautiful illustration, my uber talented friend. Argreed.. With both Sally and Jane. Very sad that a 130+ year old institution is about to be gone. However, your tribute is both touching and beautiful. A lovely tribute, Bill. Bravo! I remember seeing the circus when I was a kid. We lived in a small town and the only venue big enough was the high school stadium. Oh! And then we saw the circus again when I was in high school. That was under the Big Top, so it was lots of fun. A college friend became a clown in the circus, and she let us see her “room” on the circus train. Oooh, it was tiny! Finally, we fell in love with the “new circus”: Cirque du Soleil. That was such fun for so many years. Thank you for noting the passage of a great old American institution!